We have only every blogged recipes which are our own, but today I had to make an exception. 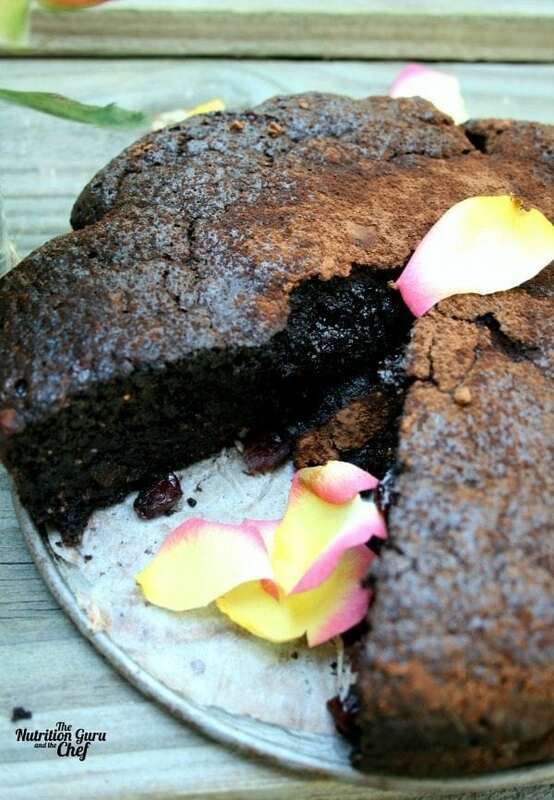 I had heard about how good Tania Hubbard’s gluten and grain free ‘Chocolate and Chia Seed Cake’ was, but just didn’t get the full grasp of this until I made it for myself from her book ‘Gluten Free Grain Free – Food We Love’. I was actually blown awaynot only with the amazingly moist texture of the cake, but the wonderful earthly flavours and also how nutritious the cake is. If you take a look at the photographs I have taken, it looks like a fudgy chocolate cake with 20 different steps and 30 different ingredients. But this couldn’t be further from the truth. Tania’s cake is in fact a one bowl wonder and basically consists of almond meal, cocoa, eggs and chia seeds. Tania Hubbard is a local Sunshine Coast gal who has started to cause quite a stir across Australia and New Zealand with her knowledge and passion for all things gluten and grain free. I first met her at the Noosa International Food and Wine Festival, where she was showcasing her gluten and grain free bread, cookie and cake mixes. Her logo is a picture of a young lady waking up with a smile on her face, and her slogan is ‘wake up happy’. She certainly is a lovely happy lady. Several years ago, Tania was diagnosed with Coeliac Disease, a disease where the body’s immune system responds unnecessarily to a protein found in grains. After the diagnosis she changed her diet to one which was gluten and grain free and for the first time in a long time she ‘woke up happy’. Her book came to fruition after developing her own recipes to unleash the restrictions she felt existed on the diet that people with Coeliac disease had to follow. The book has clearly done that, with 150 pages of delicious recipes such as chickpea flatbread, zucchini bake and a toasted muesli – all gluten and grain free of course. Next on my list of things to make from her book is the Chocolate and Banana Mousse Cake. If you would like to take a peek at the website, do so here. I recommend the book for anyone who has gluten or grain intolerances or who suffers from Coeliac Disease, but also anyone just wishing to find some scrumptious recipes. I have used a couple of different ingredients to the recipe which you will find in bold. 4 tablespoons chia seeds, soaked in 1 cup of water for 15 minutes. Line a spring form cake tin with non-stick baking paper. Soak chia seeds (and cranberries if using), in 1 cup of water for 15 minutes, stirring regularly. The seeds will absorb all the water and swell to form a gel. Whisk to combine well & break up any lumps (at least 1 minute). Pour into lined cake tin. Bake in oven for 30-35 minutes or until it bounces back when pressed in middle. Please note that I cooked my cake for an additional 10 mins (so at least 40 mins). Let the cake cool for 5-10 minutes in the tin. Finish cooling on a wire cooling rack. Dust with cocoa when cool. When I made this cake, The Chef was at work and wasn’t due to come home until about 1am. I often make him a tasty treat and leave it with a note on the kitchen bench for him to come home to. Here is the note I left him with the cake. When I got up thismorning and he was still asleep, I found most of the cake demolished! 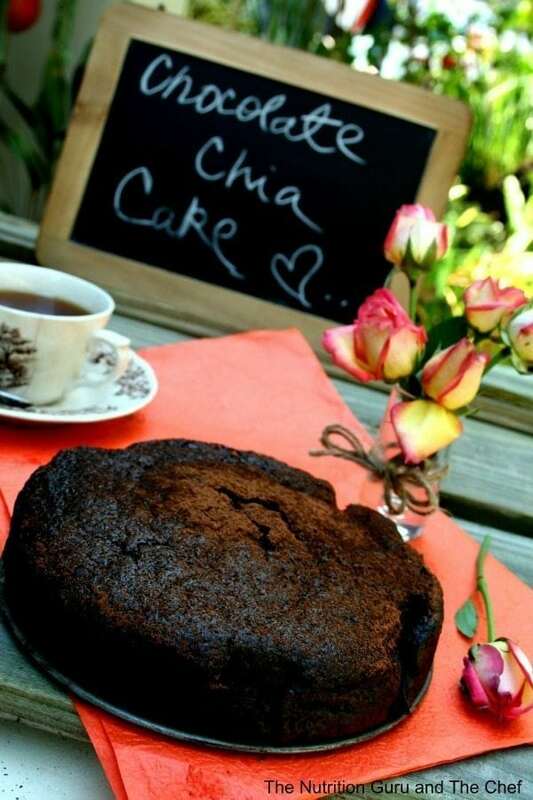 Stay tuned, because Tania will be sharing her special chocolate glaze for this scrumptious cake! 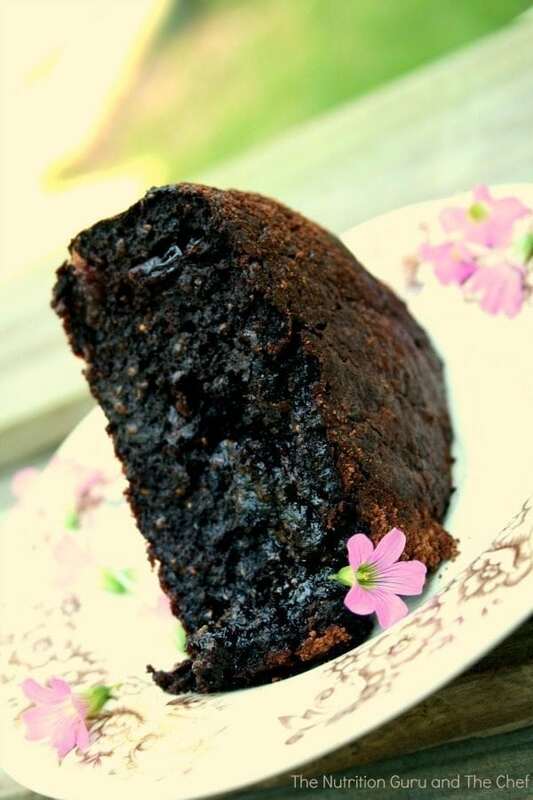 In the meantime, you can read how packed full of health benefits this cake is. Chia Seeds: Very high in fibre, protein and iron as well as cancer preventative antioxidants. They also contain Omega 3 oils which are essential for keeping skin healthy, reducing inflammation and protecting our heart from heart disease. Almond Meal: provides fibre, vitamin E and ‘good’ monounsaturated fats. Olive Oil: Rich in monounstaturated ‘good’ fats which is now very well known to be protective against heart disease, good for the brain, and wonderful at keeping skin hair and nails in good shape. The olive oil gives a beautiful ‘fruity’ flavour to the cake and makes the cake super moist as well. Could I replace the almond meal with peanut butter “flour”? Thanks! Hi Liz, I don’t think you could. The peanut butter flour is more to make a peanut paste with and I have a feeling that it would make the cake a goopy mess. You could certainly have a try though? You could use plain flour, or even cornflour if you wish. Okay, I’ll probably invest in some almond meal. Thanks! This was an amazing cake, easy to make and so tasty, it is my favorite now. What size pan did you use? And would you know what 180 Celsius is in Fahrenheit? 😀 Thanks! I am allergic to nuts. Do you know of an alternative for almond meal? Hi Jenna, sorry for late reply. You can use equal quantities of plain or wholemeal flour or track down some coconut flour which would also work deliciously! well I made this scrumptious looking cake and it didn’t turn out that great. I forgot to get almond flour, so I used coconut flour, coconut oil, and the rest was the same. It was real dry. Im not the BEST baker but this recipe seemed fool proof. Hi Stephanie, well done for being adventurous and using your own ingredients. The cake would not have turned out properly because of the coconut flour. Coconut flour is very high in fibre which soaks up any liquid, hence making the batter very dry. If wanting to use coconut flour you will need to experiment with adding more liquid to the mixture to balance the mixture out.